Tour the outermost loop of the park on this fun course. 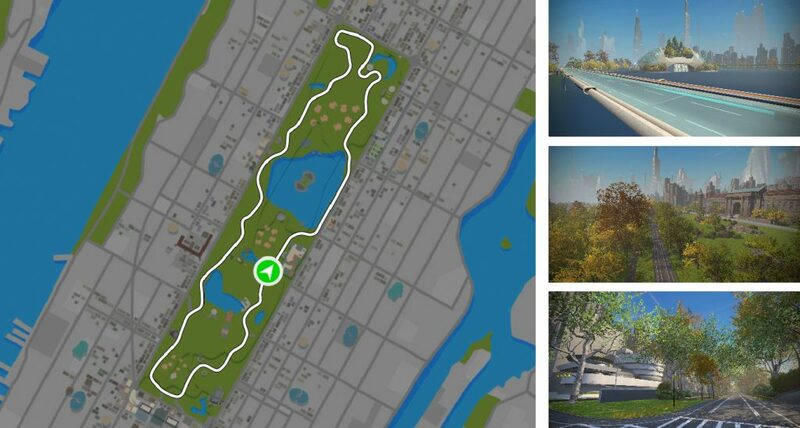 Just under 10 km, this is the most well-known route in Central Park. This is a favorite route for racers. The Park Perimeter Loop is a great place to knock out some laps and get familiar with the Park. Located just outside the Park on 1071 Fifth Avenue on the corner of East 89th Street, the Guggenheim first opened in 1959. Designed by celebrated American architect, Frank Lloyd Wright, the cylindrical building is wider at the top than the bottom, like a collapsible camping cup, and recently displayed a dragon built from bicycle parts. One of two restaurants in Central Park, the Loeb Boathouse was designed in 1874, demolished in 1950, and rebuilt in 1954 thanks to a large gift from the investment banker, Carl Loeb. Located on the East Side of the park between 74th and 75th Streets, the restaurant is the daily meet-up for a passionate group of bird watchers. The perfect spot for a romantic meal, rowboat rentals and rides in an authentic Venetian gondola are also available. Located west of the park, The American Museum of Natural History is one of the largest in the world — it takes up four city blocks. The complex includes 28 interconnected buildings, housing 45 permanent exhibition halls, a planetarium, and a library. All in, the museum collections contain more than 33 million specimens of plants, animals, fossils, minerals, rocks, meteorites, human remains, and human cultural artifacts. The future includes flying transportation. A small group of Manhattanites own vehicles. But most use ride-sharing vehicles as well as good ol’ yellow cabs, upgraded for the times. “The flying cab was one of the first things we built. It helped define that the course was in the future,” says Miguel. More cars followed that included private vehicles, classic-looking cabs as well a few modern cars, police cars (sometimes in pursuit! ), and even a few luxury vehicles. “If you pay attention you’ll see some cool details, some nods to famous car models,” says Miguel. Some cars fly. Some drive on the roads. And all of this begs the question: what’s the future of traffic in Manhattan? ”It’s a free for all,” says Miguel.